Cabinet Landing on the banks of the Clark Fork River was a rough construction camp for the Northern Pacific Railroad. This tent city of over 3,000 people became a ghost town over night when the construction moved up the line. Many small communities sprung up along of the Northern Pacific Railroad as the tracks were laid down in 1882 only to become ghost towns a few years later. Cabinet Landing is one such vanished town. Cabinet Landing began as a steamboat landing at the base of the Cabinet Rapids on the Clark Fork River. 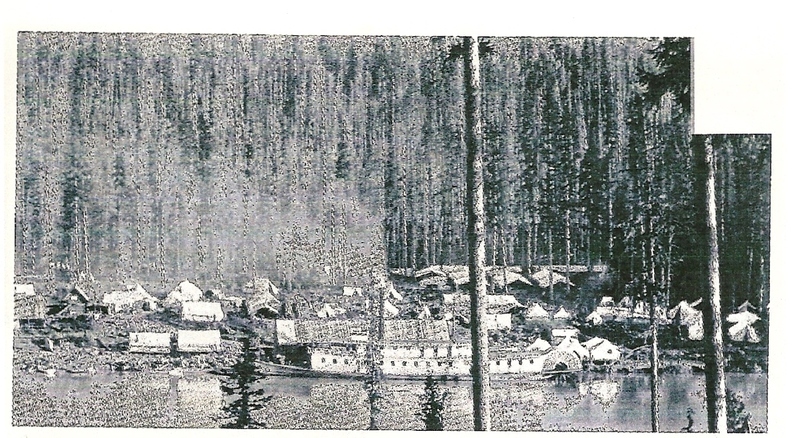 During the gold rush in the Wild Horse country of British Columbia in 1866, miners arrived at Pend d’ Oreille City at the southern tip of Lake Pend Oreille where they boarded the Mary Moody steamer for a cruise up the lake and ascending the Clark Fork River to this steamboat landing. At Cabinet Landing the miners would walk around the rapids and catch a steamboat to continue the journey north to the gold fields. 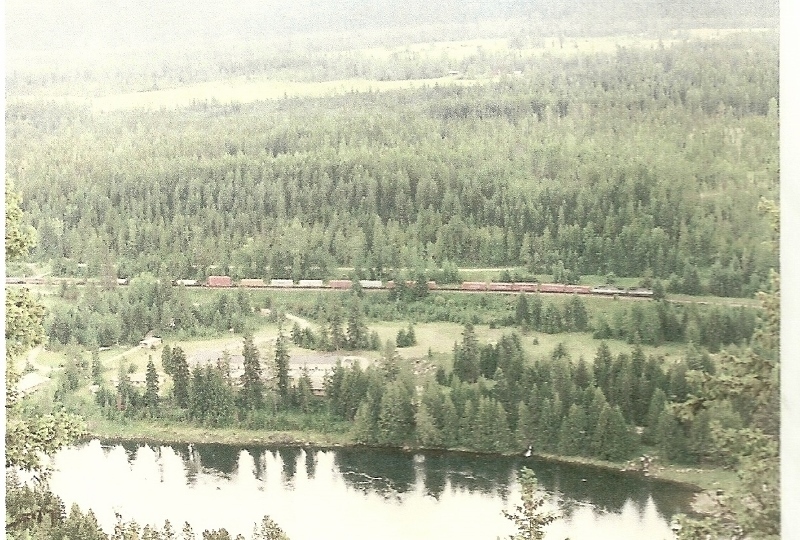 Prior to the arrival of the miners French Canadian trappers passed through the area and according to legends gave Cabinet Gorge its name because it resembled kitchen cabinets. An archeological survey completed in 1985 found evidence that the meadows and river bank at this location were a popular hunting and fishing location for Native American tribes as far back as 6700 BC. During the 1860’s gold rush to Canada, Cabinet Landing consisted of two houses, a large shed for mules and horses, and a saw mill. With the arrival of the railroad construction, the community exploded into a large settlement. Per the Weekly Missoulian , dated May 19, 1882, the settlement was the center of the railroad construction and was comprised of 6 stores for white men, 3 stores for the Chinese, 2 Chinese laundries and wash houses, 6 eating places, 2 lodging houses and between 16 to 20 saloons. The population grew almost overnight to approximately 4,000 people. Tents and shacks lined the hillside. Shortly the saloon houses grew to 33 and the town became wild and wooly. A satellite community grew up on the opposite side of the river to houses the supervisors, elites and their families in a calmer, cleaner camp. The railroad brought in Chinese and Japanese workers from their home countries to work as laborers for the company. By early June Cabinet Landing housed 2,600 Chinese laborers, 1,400 white laborers and 535 horses. This boom was brief, and as railroad construction work moved on the community declined. By 1910 the Idaho State Gazeteer reported a population of 100. By 1916 the population had dropped to 75. In 1951 the Morrison Knudsen Corporation started construction on the $47 million concrete gravity-arch hydroelectric dam at Cabinet Gorge on the Clark Fork River above the site of Cabinet Landing. The 208 ft high 600 ft long dam was complete in November 1952. 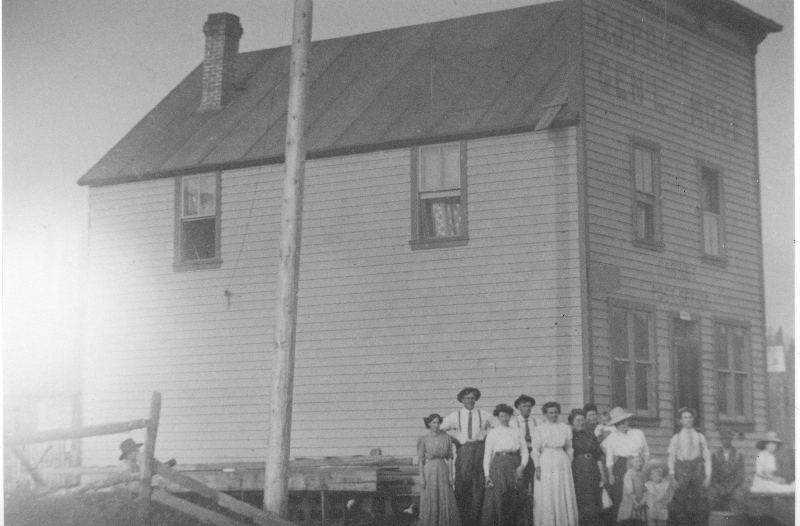 The community of Cabinet became a small rural community with a post office and school until the 1950’s. The school at Cabinet closed in 1952 and the post office closed in 1954. A fish hatchery, a cemetery and several rural homes are all that remain of this once bustling community. Cabinet Landing in the summer of 1882: The Henry Villard steamboat of the Northern Pacific Railroad is docked at Cabinet Landing in the summer of 1882. The landing was the construction camp for the building of the railroad. It consisted mainly of tents and shanties but boasted having 33 saloons at one time. Courtesy of the Denver Public Library, Western History Department and Gary Weisz, local historian. Cabinet Landing in June of 1994: Cabinet Landing on the Clark Fork River June 1994. Nothing remains of the railroad settlement also known as “The Front” since most of the buildings were tents and shanties. When the construction crew moved up the line into Montana, the town became a ghost town. Photo courtesy of Gary Weisz, local historian. M J Price General Merchandise circa 1910: A group of Cabinet residents in front of the M J Price General Merchandise circa 1910. The store also housed the local Post Office that operated until 1954 when it was consolidated to Clark Fork. Courtesy of the Bonner County Historical Museum. The suspension bridge across Clark Fork River. 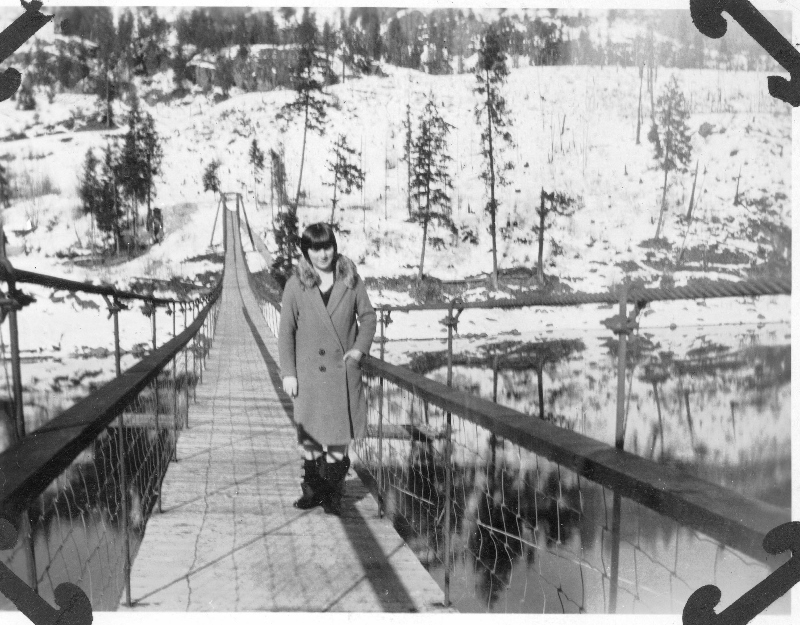 : A young woman stands on the swinging suspension bridge that spans the Clark Fork River at Cabinet. The bridge was used by students to cross the river to the school on the other side. Courtesy of the Bonner County Historical Museum. Mary Garrison, “Cabinet Landing,” Spokane Historical, accessed April 20, 2019, https://spokanehistorical.org/items/show/572. Landrith, Keith, Keo Boreson, and Mary Condon with Principal Investigator Jerry Galm. “Archaeological investigation at the Cabinet Landing Site (10BR413) Bonner County, Idaho. Report Number 100-45.” Eastern Washington University Reports in Archaeology and Archaeological and Historical Services, Cheney, Washington,1985.